I get up this morning and have a look at the Riverford website to see what vegetables they’re going to deliver to me today, and it says aubergine. Hurrah. I like aubergines. I like them so much I even announce to all my Facebook friends that I was looking forward to getting an aubergine. Yes, I’m that sad. Although, to be honest, I wasn’t as unduly excited as I was when I was expecting a pineapple. However, when I get home, I don’t find an aubergine in the box, I find asparagus. This doesn’t unduly concern me as I like asparagus. I think I like it as much as aubergine but I had already planned my Quorn recipe for the aubergine so now I’ve got to think again and I try not to think too much if I can help it. And so, later on, I have another look at the Riverford website to see if it really did say aubergine and either they changed it when I wasn’t looking or it never said aubergine in the first place, as it says asparagus again now and after consulting the BBC website to see what’s in season at the mo, it would appear that I am stupid or blind or a combination of the two, as aubergine’s aren’t even in season until July. Gulp, my last food post was over a month ago. I have eaten since then, honest. 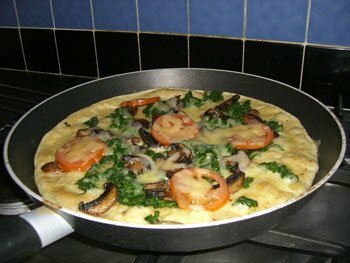 In fact, I’ve made a couple of great recipes from the wonderful Veganomicon, when I make them again, I’ll blog them. I’ve also been making my weekly soup and having my weekly organic veg box delivered although with my imminent move to the country, my time has been filled mostly with making lists of things to do, and then not doing them. But as I was deserted this morning by The Meat Eater citing reasons of wanting to ride motorbikes and jump out of aeroplanes, after customising my Twitter background (@jogblog if you want to follow me), I decided to make my soup early and after investigating the contents of my fridge, decided upon leek and mushroom soup. With added potatoes and spring greens (the spring greens were a surprise, I was expecting spring onions. Similar? I don’t think so). Cook the onions and mustard seeds in some stock for a few minutes. Add everything else. 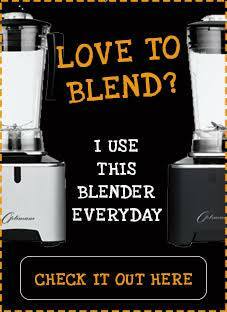 After about 20 minutes, blend it. Go back to ignoring your to do list. You’ve probably heard of Fiona Oakes. She’s the founder of the Tower Hills Animal Sanctuary, where she cares for over 400 animals without making a single penny for herself (in fact, every month the feed bill exceeds donations by £2,200). And as if that wasn’t enough, in her “spare” time she trains for marathons. Lots of them. And not only that, she’s bloody good at them too. 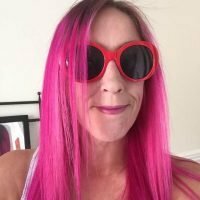 This year Fiona will be running London Marathon on 26 April. But she won’t be at the back with the fancy dress brigade, she’ll be at the start with the elite women where she’s hoping for a top 20 place. Please visit her website and do all you can to support her, she really is an inspiration. I saw lambs today. Titchy, tiny ones. They were very cute. That has absolutely nothing to do with this blog but I just thought I’d mention it. 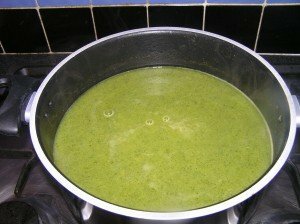 So, after seeing lambs (titchy, tiny ones) I escaped the countryside (nasty thing the countryside, completely pointless, whoever invented it needs taking outside and giving a good kicking) and came home and made soup. Leek and potato soup to be precise. By the way, I’ve given The Meat Eater user privileges on this blog, so watch out for his guest Delia’s Chocolate Marbled Energy Bars blog post shortly. 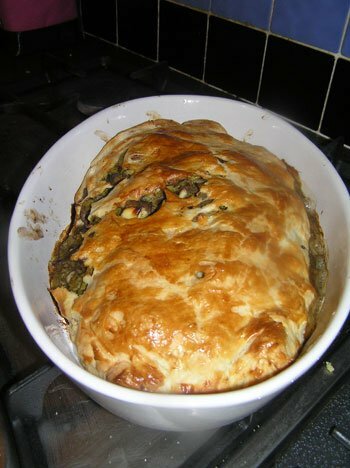 I am out of leftover homecooked food in the freezer so decide I will make a couple of recipes out of my new cookbook The Seasoned Vegetarian by Simon Rimmer and as usual, it’s the ones with cream and cheese that take my fancy and tonight’s recipe of choice is Rice & Mushrooom Parcel. 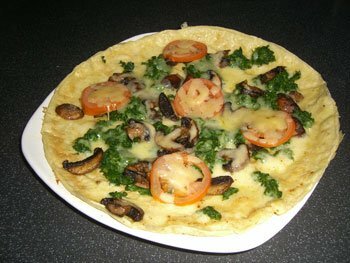 Although it has no cream in it, or cheese, but it does have mushrooms. And puff pastry. What more does a girl need? Ah, wine. Of course. 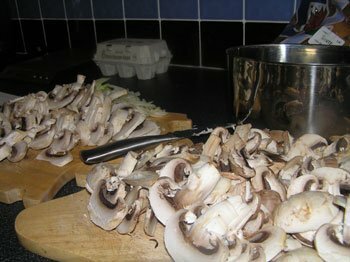 After I’ve spent five minutes of my life that I’m never going to get back slicing 600g of mushrooms and an onion, I pull out of the drawer my big frying pan and wonder if it’s going to be big enough for The Walthamstow Mushroom Mountain and decide it probably won’t be and therefore it will take longer than the five minutes Mr Rimmer reckons it’s going to take for the onions and mushrooms to cook. Still, Eastenders isn’t on yet so all is good. But before I start on this frying a mushroom mountain exercise, I have to hard boil two eggs. HELP! I’M STUCK! I don’t know how long it takes to hard boil an egg. I decide it’s about 10 minutes, which is handily how long it’s going to take to boil the rice I also need to cook. Synchronisation, like swimmers. Except in egg-form. And rice-form. After about 10 minutes or so, I decide the mushrooms and onion have cooked enough and I pour it into a bowl along with the chopped hard boiled eggs and rice (that is a pretty yellow colour thanks to the turmeric). Now it gets tricky. It’s always tricky when pastry’s involved. Even if it’s ready-rolled pastry. 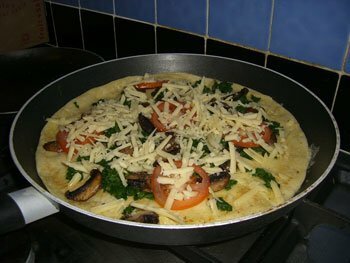 I get the pastry out of the packet and the recipe says put the mushrooom and rice filling mixture down the middle of the pastry. BUT THERE’S F*****G TONS OF IT! Still, undeterred I pour the mixture onto the middle of the pastry. 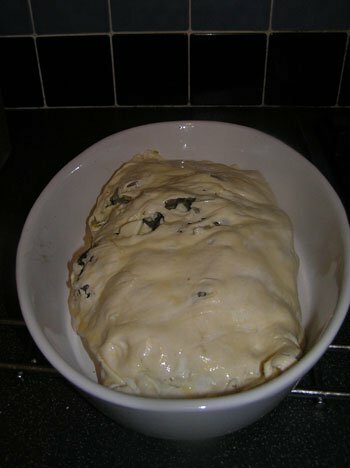 Now it says to wrap the pastry around to enclose the filling. Wrap it like a Swiss roll or just fold it over? I’m confused. I decide on the Swiss roll approach and not too much filling oozes out of the sides and I even get to squish down the edges that I have brushed with egg. There are, however, a few holes. Ho hum. But I decide not to try and patch the holes up and put it in the oven and after 25 minutes I decide it’s ready and there’s no way it feeds two, more like four, as it’s massive, even for a glutton like me. And hurrah, it’s delicious. 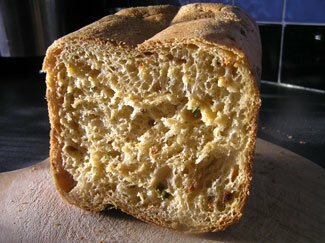 And definitely one I’ll be making again, although I think it’ll be nicer without the egg so won’t be adding that again. If The Meat Eater’s lucky, I might even make it for him one day. For the parcel filling, cook the rice in salted boiling water with the turmeric and lemon zest for about 12 minutes until just tender, then drain. 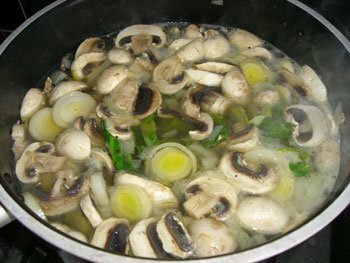 Meanwhile, melt the butter in a pan and gently fry the onion and mushrooms for about 5 minutes until soft. 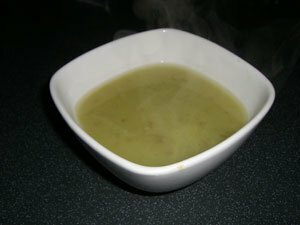 Tip into a bowl. Stir the cooked rice, herbs and chopped hard-boiled eggs into the onion and mushroom mixture and season with salt and pepper. Cut the pastry into a rectangle measuring 30 x 20 cm (12 x 8 cm inches). Place the filling mixture down the middle of the rectangle, brush the edges of the pastry with beaten egg, then wrap it around to enclose the filling and press the edges together to seal. Roll the parcel over so that the long seam is underneath and brush with egg wash.
Place the parcel on a baking sheet and chill in the fridge for 30 minutes. Preheat the oven to 200C/Fan 180C/Gas 6. Sprinkle the pastry with sesame seeds, then bake for 30 minutes until crisps and golden. Serve hot cut into thick slices. Tracey, Carmen and Jools who have each won a copy of The Seasoned Vegetarian by Simon Rimmer. Please email me your addresses and I will post your copy out to you asap. I arrived home last night to find a pineapple on my doorstep. I’ve never had a pineapple on my doorstep before. In fact, I don’t think I’ve ever had a real live pineapple before, only out of a tin. So I’m very very excited by this. Yes, I’m a saddo. 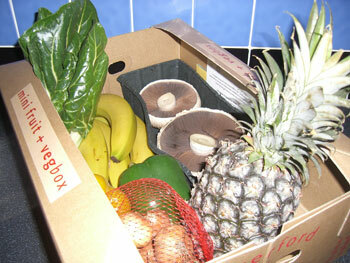 Also within the mini fruit & veg box are two portobello mushrooms (only 2? Shame), 1 yellow pepper and 1 green pepper (bit stingy on the peppers this week too), a bag of shallots, some Swiss chard and 4 bananas. And when I’ve emptied the box I find two free vanilla pods which are apparently a (very) belated Christmas present. I like presents. Thank you Riverford. And during the week as I was telling Facebook how excited I was to be getting a pineapple in this week’s delivery, a friend warned me that when he and his wife get round to eating theirs, it’s usually gone off and so I heeded this warning (all warnings should be heeded, I reckon. Is anything else heeded?) 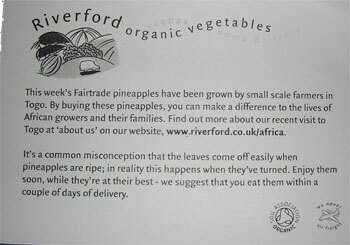 but I needn’t have bothered with the heedering as Riverford had very kindly added a note in the box suggesting I eat the pineapple within a couple of days of its delivery, so it’s pineapple smoothies for me this weekend. Should power tomorrow’s 8 miler nicely. 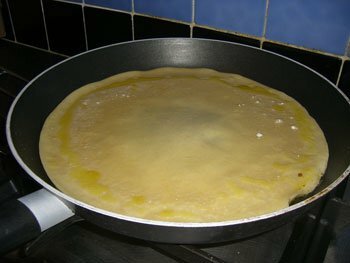 Since the last time I went to My Old Dutch in Holborn, I’ve been craving pancakes, and what better time to make them than on Pancake Day? and now I know how easy they are to make and how tasty they are, I think I’m going to make them every day. Should be compulsory really. 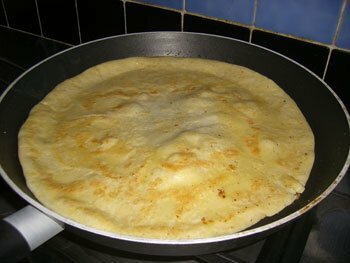 Eat it and be full of pancake all night. 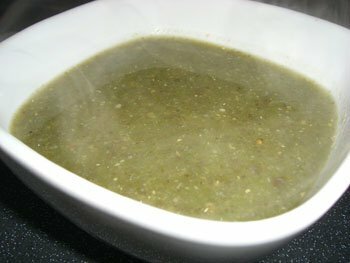 Another look-in-the-fridge-and-see-what’s-left soup this week. 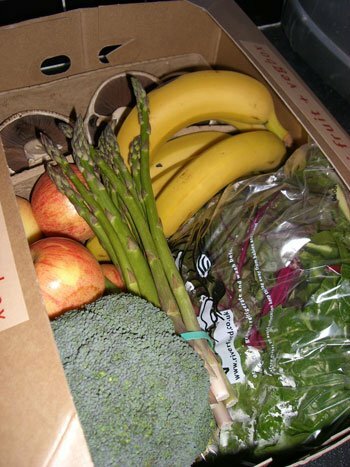 A yellow pepper is still hanging about from the box delivery two weeks ago, and this week’s box brought me broccoli and cabbage. An onion would have been useful but I forgot to buy one. And I wouldn’t have added chili powder and curry powder but I had hardly any curry powder left. Ho hum. Still, a very nice soup it turned out to be indeed. 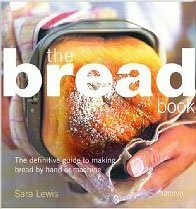 Last night I’m trying to decide whether or not to make some bread and because I can’t think for myself, I put this pondering onto my Facebook status like the saddo I am and it gets the thumbs up from Julia and Mark and so then I have to decide what bread to make and in my fridge there’s some sundried tomatoes and some jalapenos and so I think aha, I will make sundried tomato and jalapeno bread and I adapt a recipe from The Bread Book: The Definitive Guide to Making Bread by Hand or Machine and hope for the best and in the morning I have a perfect loaf of gorgeous smelling bread and I tuck into it as fuelling for my long run.